First things first, what made you decide to pick up Scythe? Anjali: I’ve only read Unwind by Neal Shusterman, but when I saw this book was coming out I knew I really wanted to read it. The themes and the ideas in the story really interested me, and it did not fail to live up the hype I had read around it either. Erin: If you've read our Meet The Team bios you may already know that Neal Shusterman's Unwind series is one of my all-time favourites (I've also enjoyed a couple of his other books too!). I love his writing style and enjoy that he often tackles topics and themes that really make the reader think. 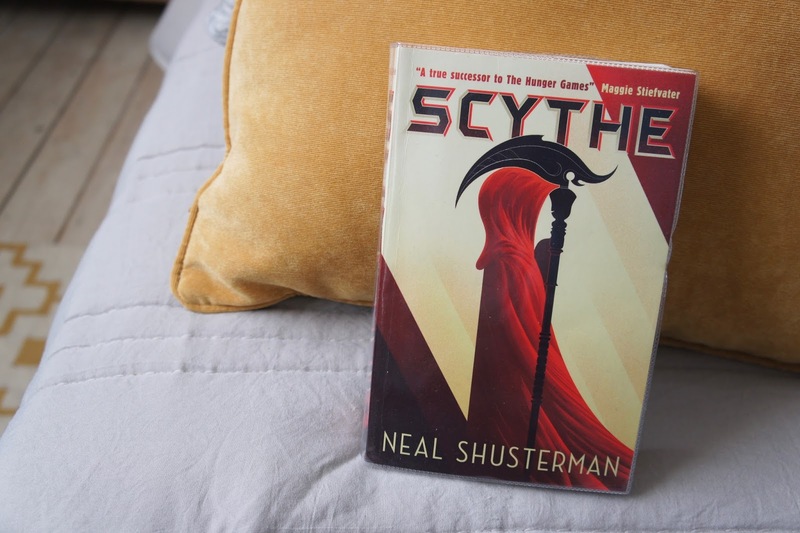 The blurb for Scythe was super intriguing with a unique utopian concept so I automatically added it to my TBR. Were there any characters you wanted to get to know better or that you hope to learn more about in the sequel? Anjali: While we did get a little bit of Scythe Faraday’s story towards the end of the book, I’d like to know more about his past. I’d also be super keen to read about another junior Scythe who is a little older than Citra and Rowan, and what their experiences were like, looking back a few years on. Erin: The character I found the most interesting was Scythe Faraday and in the sequel I would love to hear more about his story as well as Scythe Curie's. In the first book we learn that they are both well-known scythes and have been alive for a very long time so I think they must have a lot of fascinating stories to tell. If we don't get to explore their past lives further in Thunderhead, I think they could possibly make great companion novellas to the series. Hypothetically, if this were to happen in real life, do you think the Scythedom would be a feasible solution? Anjali: Stepping back from the story, and just looking at the idea of conquering death and how you’d deal with that as a society, hypothetically, I don’t think there would be a solution, feasible or not. Even if rules or regulations like the Scythedom (people being selected for death to avoid overpopulation), or stopping people having kids, or capping the amount of times that people can ‘turn the corner’ to go back to a younger age, there would always be problems. Someone would get upset, someone would want to change the system, someone would think they could do it better. Humans, as great as we might think we are, are flawed. We’re incredible, complex beings, but we are flawed. Our birth and death are the bookends of our life, and without the stopper of death at the end of the shelf all the books fall off and create a big mess. Such would it be with ‘conquering’ death; a big mess, unlikely to have any real solutions. Erin: The simple answer to this question is no. There are so many reasons - including some of those that Anjali has shared her thoughts on - why a Scythedom wouldn't work as a solution. I can't really ever see an idea like this being successful but as with any basis for a utopian world, even if there was a chance the concept worked for a length of time it certainly wouldn't be a feasible long-term solution. Do you have a favourite quote from the book? Erin: If I had been able to get my highlighters on this book the pages would have been full of colour, but sadly I didn't think the library would appreciate my annotation! I also forgot to keep track of any quotes that stood out as I read because I was enjoying the book so much. I think I'll have to add a copy to my collection and re-read it, highlighters in hand, in the future. Any final thoughts on Scythe? Anjali: I loved this book. A lot. Few books I’ve read these days have really got me thinking, and, if my answer to question 3 is anything to go by (and I did chop it down to this paragraph! ), Scythe really did. There were so many hints and nods to things in real life throughout the book, and of course, the whole concept of ‘conquering’ death that made me stop and think multiple times throughout the story. I really also enjoy Shusterman’s storytelling, and the characters he creates. Really looking forward to picking up Thunderhead. Would definitely recommend. 5 stars. Erin: I found the whole concept of Scythe so interesting and thought-provoking which made the novel such an enjoyable read. Seeing how varied the scythes attitudes towards their job were was a particularly interesting aspect and I felt the diary entry snippets included throughout were a great addition to the story. Similarly to Anjali, I also rated the book five stars and can't wait to read the sequel!